The New Haven Register Blogs: UConn Men's Basketball Blog: Who writes this stuff, anyway? Here's the UConn season preview that I wrote for Lindy's. The magazine should be on news stands in a few weeks. 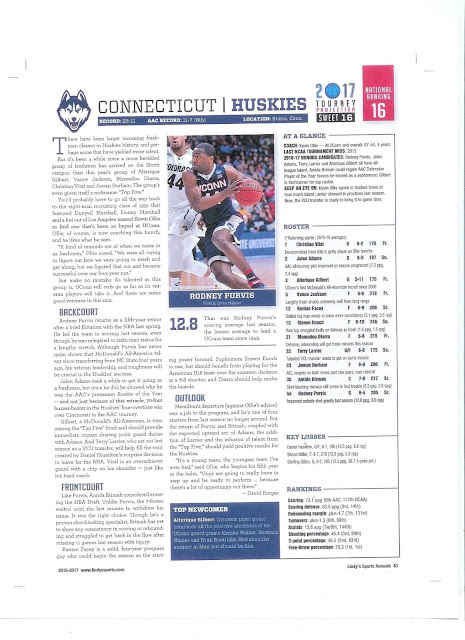 Incidentally, they've got UConn ranked No. 16 preseason, and Cincinnati right behind at No. 17. I agree the two are neck-and-neck. Really, flip a coin as to which team deserves to be preseason AAC champs. There are no other AAC teams in the mag's Top 40. SMU was going to be, until Larry Brown retired in early July. I say that SMU, Memphis or Houston could be NCAA tourney teams this season. is very interesting and informative. Thank you for the sharing.